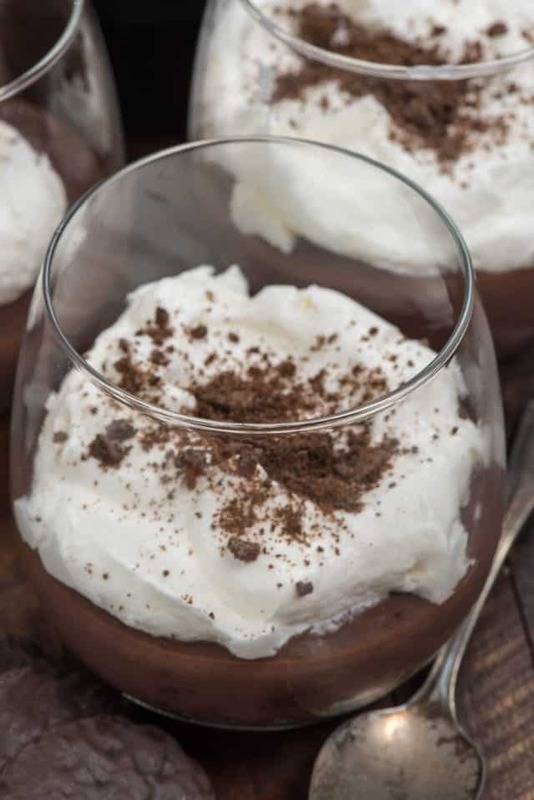 Baileys Pudding Pies are EASY to make using chocolate pudding mix and whipped cream! They have a THIN MINT COOKIE crust and taste so much like Baileys. 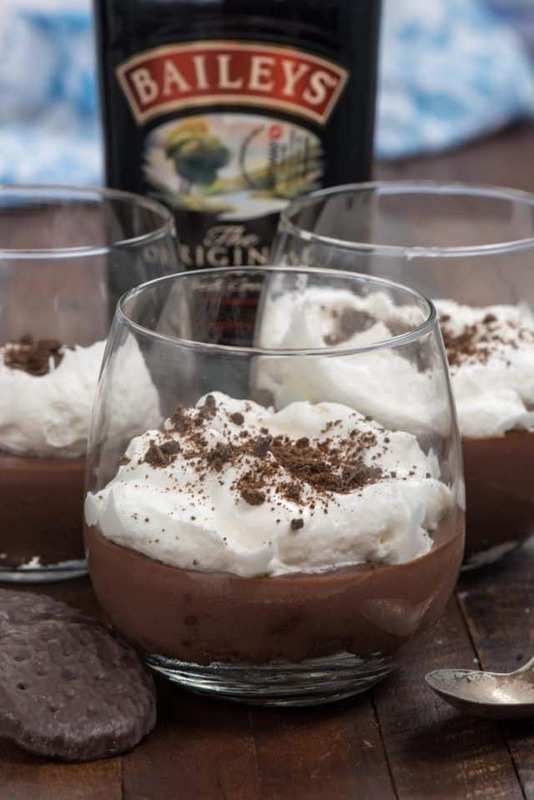 I’m obsessed with Irish cream and after you try these pudding parfaits, I know you will be too! Well hello and top of the mornin’ to ya! <<– That was my try at being Irish for half a second (although I actually think there is some Irish in there if I remember my Ancestry.com results correctly). Valentine’s Day is over, Mardi Gras is over, Easter is in 6 weeks but before the bunny visits we get to celebrate St. Patrick’s Day! Do you do anything fun on March 17? We don’t usually, except when Jordan was little we’d pretend the leprechaun messed up the house. Jordan was terrified of leprechauns for years; for the first two weeks of March she’d refuse to go anywhere in the house alone. I was so glad when they stopped building leprechaun traps and talking about them at school. 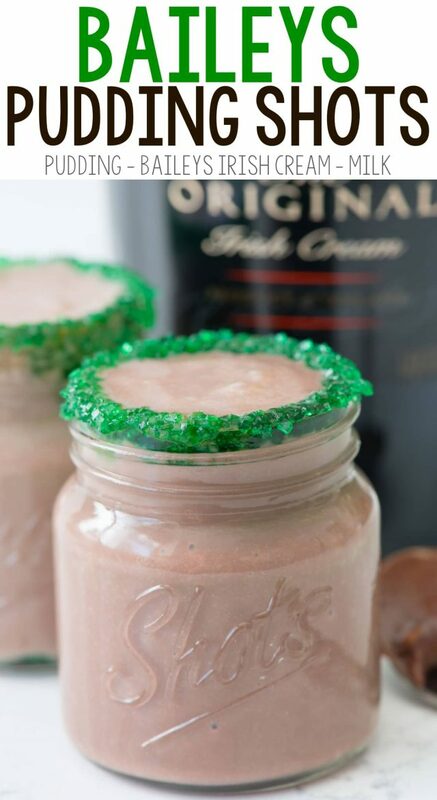 Now, Baileys isn’t really just a St. Patrick’s Day dessert, but in blog land and on Pinterest Irish cream recipes start popping up right about now. I actually love Baileys all year long, especially in my morning coffee when I’m traveling. That’s always what I use as my creamer on vacation if I don’t have to drive. I think adding Baileys to chocolate pudding is probably one of the most genius things I’ve ever done. The first time I did it I made shots: thinned the pudding with milk and Irish cream to make a drink. Those are amazing and if you’re in the mood for a dessert cocktail, I highly recommend them. 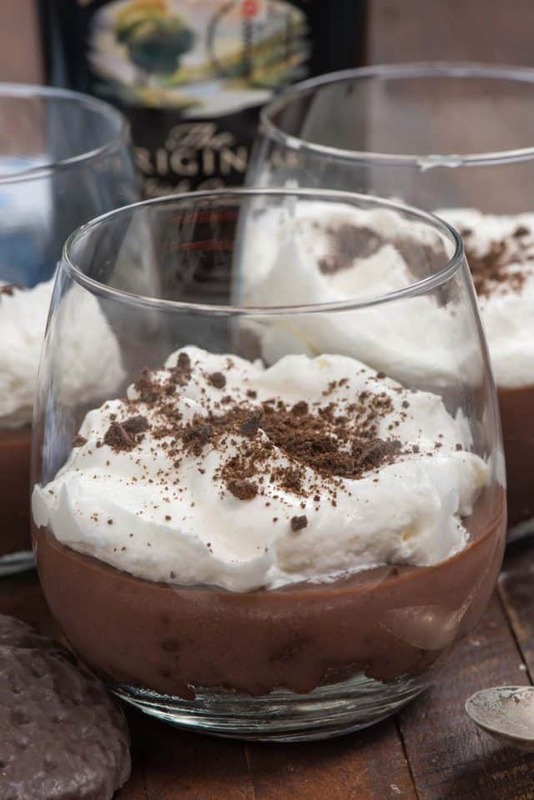 However, if you want Baileys Pudding, try this recipe. It’s a more traditional pudding, plus I added whipped cream and CRUST to make Baileys Pudding Pies! I had the unfortunate experience to make this recipe at 10 in the morning. By noon I was craving Baileys for lunch but I had to go pick up Jordan from school so I couldn’t even enjoy them until after dinner. My entire kitchen smelled like the wonder that is Irish cream liqueur…and Thin Mint cookies. The crust on this pie is made of Thin Mint cookies. 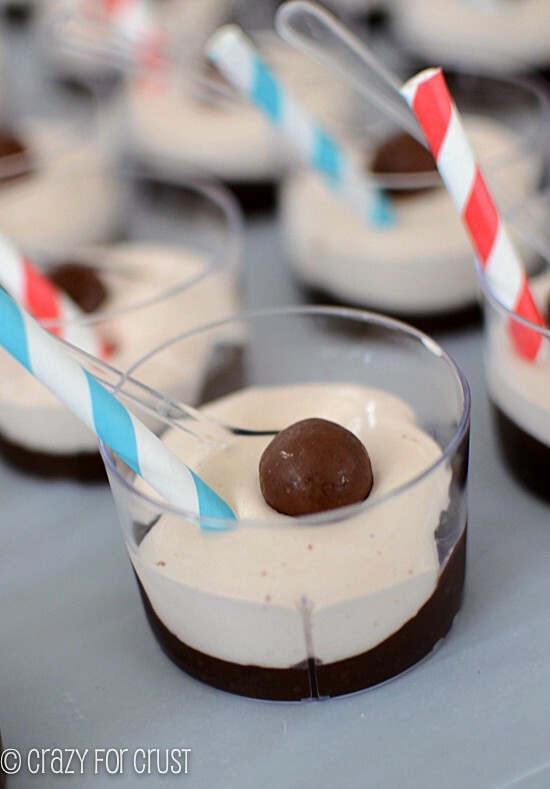 Talk about a match made in heaven: Baileys and mint and chocolate. Perfection!! 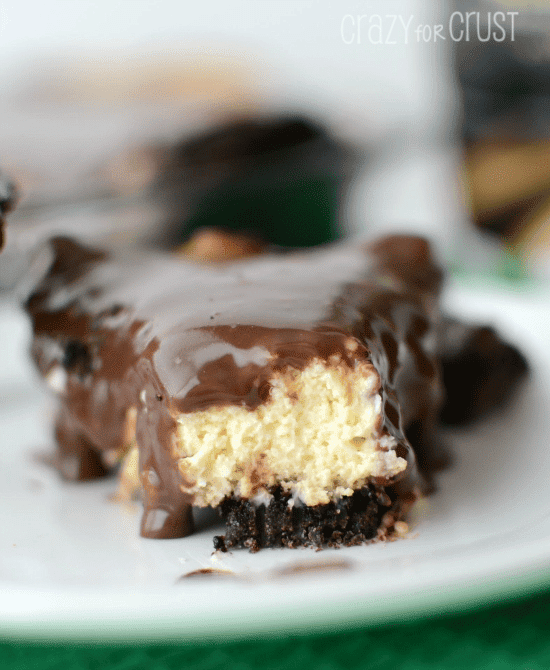 The crunchy cookie mixed with the flavored pudding and whipped cream makes these the perfect dessert for any day of the year, but especially for St. Patrick’s Day! Celebrate dessert by making Easy Baileys Pudding Pies with instant chocolate pudding and a Thin Mint cookie crust! And don’t worry: I have you covered if you can’t find Thin Mints or don’t want to waste a box on crust. I get it, those things are expensive. BUT they taste amazing with the pudding. This easy pudding recipe comes together in under 5 minutes, the whole parfait is made in under 10. It’s a miracle dessert that makes 4 perfect servings for the adults in your life! For the crust, you can use Girl Scout Thin Mint cookies or use a generic copycat. (I know that Keebler makes them.) Or, use Oreos! Be sure to use instant pudding. The pudding is soft because of the alcohol but it’s so good! Use fresh whipped cream or cool whip, whichever you prefer! Whisk pudding with milk and Baileys until smooth and no lumps remain. Set aside to set while making crust. Place cookies in a sandwich bag, seal the bag except for 1" and use a rolling pin to roll to crush the cookies. Place about 1/4 cup of cookies in each of 4 serving dishes. Reserve some crumbs for topping. Portion pudding into each serving dish. Refrigerate to set (about 1-2 hours) then top with whipped cream or cool whip and cookie crumbs before serving. If you LOVE Baileys like I do, be sure to check out Cathy’s Baileys Mousse and Lisa’s Baileys Fudge. 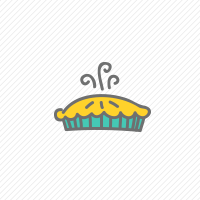 I’m in so love with chocolate pudding pies. Thanks for sharing this recipe.